Benefit by the publicity, appeal to a greater audience, and get financial benefits from the exclusive commercial use of the final product. 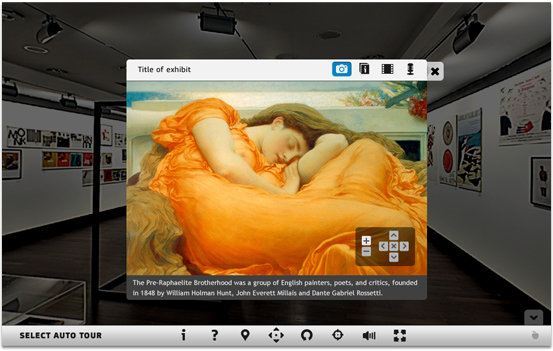 Learn more about the application’s key features or view a live demo and imagine what your museum could look like! 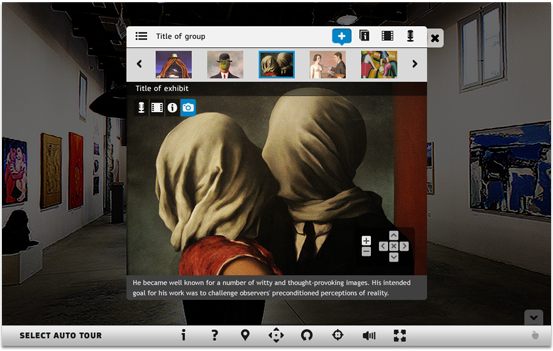 MUSEEO aims to transfer the visual experience of a museum visit on a computer screen. This becomes possible through the Virtual Tour of the actual space of the museum, the Multimedia Presentation of the exhibits and the Auto Tour through the museum. 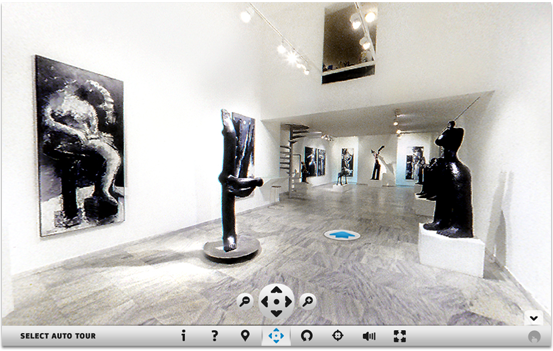 Virtual Tour allows the visitor to walk around the exhibition as if s/he was there. The photorealistic representation of the museum space and the high quality of the imagery allows the user to experience an impressively realistic tour. 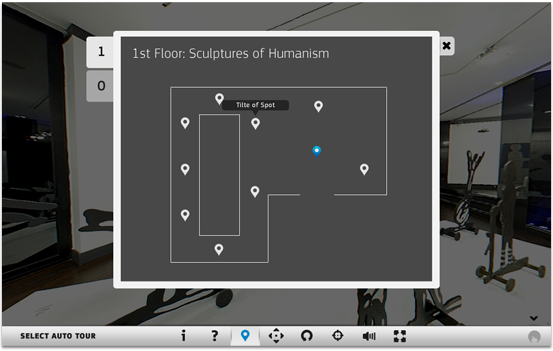 The navigation through the exhibition space becomes easy by the use of clickable areas in the rooms (hotspots), or by the use of a navigation map which shows the current and possible positions of view. In the Multimedia Presentation the user can zoom in and out of the exhibit, read the text that accompanies it, listen to the narration and watch a video about it. The Multimedia Presentation of the exhibits is fully embedded in the application and allows the showcasing the exhibits in categories and subcategories. Auto Tour follows the museum suggested route and is drawn in collaboration with the curators and the museum guides. In the Auto Tour, the navigation through the museum spaces or rooms is done automatically and it follows the narrator’s rhythm of speech and the visual directing approach that has been agreed. This is the complete list of Museeo features. The application is expandable and our expertise team can help you decide which features suit best the needs of your museum or gallery. The museum space representation is based on photorealistic 360o panoramic photography (it’s not 3D). The high quality of the imagery allows the user to experience an impressively realistic tour, both on esthetic and usability level. 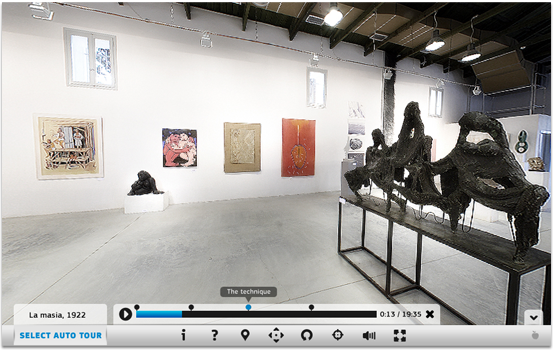 Alongside the Virtual Tour, exclusive narration and/or background sound is being supported in every thematic section of the exhibition. The user can just click on an exhibit to initiate the Multimedia Presentation that accompany it. 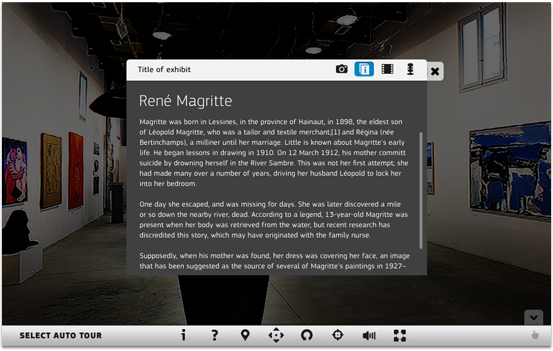 In the Multimedia Presentation, the user can zoom in and out of the exhibit, read the text that accompanies it, listen to the narration and watch a video about it. 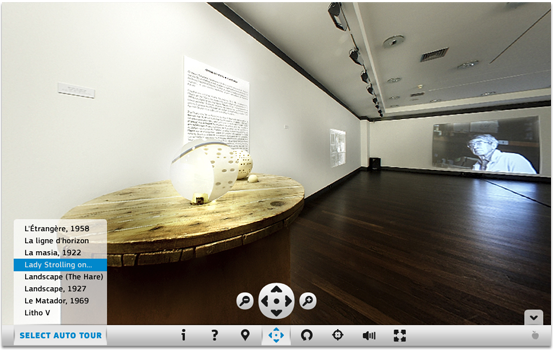 There is also the option to display all angles of an exhibit in 360o view. The application has the advantage of showcasing the exhibits in categories and subcategories, such as a showcase (category) or drawers with exhibits (subcategories). Each category or subcategory can have its own multimedia functions separately from the exhibits. The Auto Tour follows the museum suggested route and is drawn in collaboration with the curators and the museum guides. 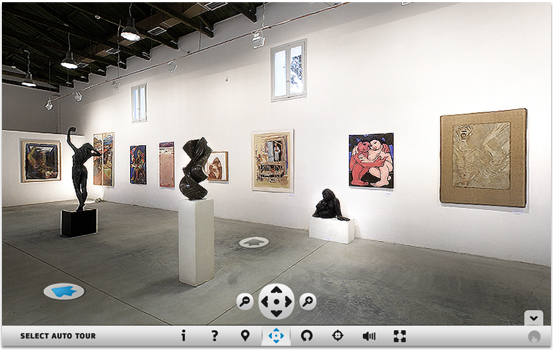 The virtual museum application supports multiple languages. The exhibits and all the information are stored dynamically so they can easily be updated. The application can be both online and offline and runs on both Windows and Mac OS platforms. 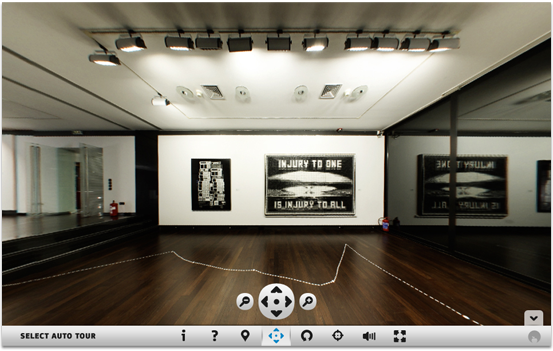 So why should you create a virtual version of your museum? Here are some of the main reasons. It promotes the creation of a unified museum network through the virtual representation of multiple museum collections and exhibitions. The application also offers several financial benefits, deriving from the publicity it will bring, as well as its commercial utilization. The museum exhibitions appeal to a larger audience. It permits access to people who are not able to visit the museum in person. Through this application the museum knowledge base is shared with the public, for educational or scientific reasons. A fully interactive archive is created of all exhibits in a museum, even of those which are not able to be displayed in the actual museum space, as well as in the event of a periodical exhibition taking place.